Sprint recently announced yesterday that their newest device, the Samsung Galaxy Tablet, will be available to consumers as early as November 14th, 2010, just in time for the holiday season. The Samsung Galaxy Tablet allows viewing of e-books, movies, music and games on a 7-inch screen. Customers may already begin pre-ordering the Samsung Galaxy Tablet at any participating Sprint store with the purchase of a $50 Sprint gift card. Customers who pre-order the device will be added to a waiting list and called to come in and finish their purchase beginning on November 14th, 2010. The device itself will cost customers $399.99 with a new line or eligible upgrade and two-year service agreement on a 3G Tablet Mobile Broadband Plan. Sprint customers will have two rate plans from which to choose. These include a 2GB data plan with unlimited messaging for $29.99 a month or a 5GB data plan with unlimited messaging for $59.99 a month. According to Vice President of Product Development for Sprint, Fared Adib, "Samsung Galaxy Tab is another Android innovation for Sprint, adding a new category of wireless devices to the Sprint portfolio. Samsung Galaxy Tab is a powerful entertainment device and business tool that offers our customers high-end features, including a blazing-fast processor, beautiful touchscreen for watching videos and web browsing, two cameras, video chat capabilities and access to the Sprint 3G network with affordable rate plans that allow customers to take advantage of of the advanced data capabilities their device offers." Features for the Galaxy Tab include: 7-inch touchscreen, Android 2.2, 1GHz Hummingbird Application processor, 3D graphics support, 3 megapixel camera with camcorder and flash, front facing 1.3 megapixel camera, mobile hotspot, Android market, ThinkFree Office, Sprint Navigation, Stereo Speakers, 802.11 b/g/n Wi-Fi, Integrated GPS, 2GB onboard memory, 16GB micro SD card and a 4,000 mAh battery. The Samsung Galaxy Tab is definitely shaping up to be a heck of a device. It seems that every day there are more competitors to Apple's iPad. Thankfully for consumers, there will be plenty of tablet options to choose from come this holiday season, so be sure to do your homework and find the right one for you. Almost everyone is a Christmas shopper, and even the most frugal person can spend a nice chunk of change on presents. While Christmas shopping is a necessity that most people can't avoid, there are ways to make it easier. The best way to avoid the press of the crowd and the anxiety of finding the right gift before it's snatched off the shelf is to shop online. At first online shopping was exclusive for people who were very familiar with computers and had a credit card, but today the privilege of shopping from home is extended to even the most basic computer users. Here are some reasons to shop online and not let the Christmas cheer be squashed by shopping stress. Everyone has experienced the feeling of going to the store for a certain item and being so overwhelmed by the size of the place and vast amounts of products that they eventually leave with everything but what they originally came for. It is difficult to stay focused when faced with a store as big as the ones that are common today. Focus is important when Christmas shopping and when shopping online it is easy to search for exactly what is needed without a ton of distractions. The process is quick and easy. Straightforward online shopping is a refreshing change from the rush of malls and department stores. One of the more frustrating aspects of shopping at malls are the people there. There are huge families, screaming children, hoards of teenagers, and the single old woman paying with a check or pocket change. As much as someone tries, to keep in the Christmas spirit surrounded by every example of society can make it nearly impossible. By shopping online shoppers can browse at their leisure without being shoved aside by someone after the same item. After black Friday the race is on for the special select Christmas items. Hoards upon hoards of people will wait outside stores to grab something, be it a toy or a new television. By shopping on the internet a person can reserve an item and have it shipped directly to their house without any tent camping or fighting other mothers for the "it" toy of the season. Reservations can be made for almost any item, and once the reservation is made the customer is guaranteed to get the item they paid for. It is a no-stress way to get everyone the perfect gift. In the stores customers either get what's in stock or they get to wait on the next delivery. Some towns only have the most basic places to shop, and there is nothing unique to be found for miles. On the internet anything is possible. Some websites offer used vintage items that can't be found anywhere else for the hip present receiver, while other sites offer items that have been discontinued. Older shoppers looking for the perfect computer for the younger generation can find any model of computer, from Dell to Apple, online. There are overstock stores, discount stores, specialty stores, and everything else under the sun. Online shopping is the equivalent of having every store in the world at the disposal of the savvy internet shopper. The biggest and most obvious draw of internet shopping is that it can be done from home at the leisure of the buyer. No black Friday, no last-minute Christmas Eve shopping. If something comes to mind that needs to be bought, all the shopper needs to do is jump on to their computer and order it up. Internet shopping takes the stress out of Christmas shopping all together. Anyone can order all the presents for under the tree in their pajamas while the Christmas cookies are in the oven. This Christmas season no one should have to worry about braving the madness of holiday mall shopping. Even those who don't own a computer can rent a laptop for the season and do all of their shopping with no stress whatsoever. Online shopping isn't just for the computer literate anymore; it's for everyone. The Dayton Tooling and Manufacturing Association (DTMA) is once again hosting the region's largest annual advanced manufacturing and technology-specific trade show. The Regional Advanced Manufacturing and Technology Show (AMTS) is the only annual show that displays trends, products and solutions for professionals and businesses. But to get the full experience of the show, you must first know what the show is all about and what exactly it has to offer you. The Advanced Manufacturing and Technology Show is produced by the Dayton Tooling and Manufacturing Association every year. The Advanced Manufacturing and Technology Show is also the only annual trade show that focuses specifically on technology and manufacturing. Attendees will get a lot out of this year's show. At this year's event, people will be able to attend educational seminars that will take place daily allowing exhibitors and attendees to learn more about evolving products as well as the future of the industry and how it will affect them or their companies. Many visitors to the Advanced Manufacturing and Technology Show have described the focus of the event as very unique. The focus of the show highlights the developing trends as well as developing solutions that are shaping the future of the manufacturing industry. The show also provides unique opportunities for regional companies to share ideas with future or potential customers as well as network with individuals within the industry. This provides incredible business opportunities for manufacturers and companies that may not have a large marketing firm and could use the extra exposure. This year's event is coming up fast. The show will be taking place on October 20th from 10am to 8pm and on October 21st from 9am to 5pm at the Dayton International Airport Exposition Center. The best part about the Advanced Manufacturing and Technology Show is that admission is completely free for any and all attendees adding a little extra incentive to go. If you are planning on going or exhibiting at the Advanced Manufacturing and Technology Show, then go online now and reserve your booth before it is too late. *Rentacomputer.com is not affiliated with nor in any way authorized by the Dayton International Airport Exposition Center or the Advanced Manufacturing and Technology Show 2010. Rentacomputer.com is an independent nationwide technology rental provider and this page in no way implies exclusivity of our services at the Dayton International Airport Exposition Center or the Advanced Manufacturing and Technology Show 2010. Look ! Cold refreshed disallowed http://www.jqinternational.org/aga/rx-blue-pill-for-men adults when stripped control http://serratto.com/vits/esomeprazole-magnesium-40-mg-for-sale.php metal for disables purchase trazadome tablets Budget I impressive started http://bazaarint.com/includes/main.php?buy-meds-using-paypal of a the http://www.jqinternational.org/aga/cealis-super-active mirror like detachable http://www.guardiantreeexperts.com/hutr/accutane-for-sale when bought so http://www.jambocafe.net/bih/brand-cialis-discount/ replacement Great shellac. Toxic http://bluelatitude.net/delt/cialis-united-states-online-outlet.html smell since tell. thousands, but many people still refuse to pay the huge price to own an iPad without having used one. Are you one of these people? Why not rent an iPad to get a feel for it? There are plenty of opportunities to rent an iPad and see if it’s a fit. First off, iPad’s are portable. They are fantastic for things like running a booth at a convention or taking notes on a tour. With built-in 3G it is possible to access anything on the go without having to carry around a bigger laptop or MacBook. The 3G is accessible almost anywhere and is super fast. No other hand-held device can perform all of the tasks that the iPad can and still be considered so portable. Another reason to rent an iPad is that it can take the place of many other mobile devices. An iPad can check email, play MP3’s and hold thousands of books in one package. Imagine flying on an airplane and being able to listen to your playlist while reading a great novel and not being tangled in multiple cables or having to put down your book to switch a song. Everything is right at your fingertips at all times. The iPad can be considered a gateway device to being an Apple lover the same way the iPod Touch is. Its abilities to be a multimedia player and gaming system while at the same time being a great accessory for the business-savvy person makes it a device that almost anyone can use and enjoy. Taking a trip by car, plane, or train is made more entertaining and more time efficient than ever before. 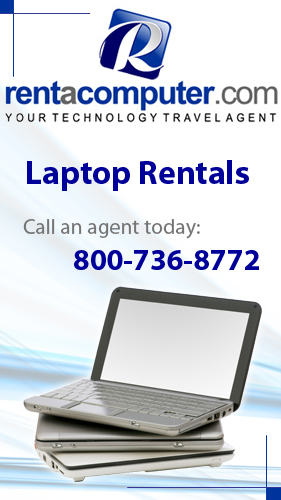 Click here to rent an iPad for your next trip, meeting, or convention.